Hey guys! Here's another eye makeup look I decided to post on here! I will soon update my blog a little bit with some outfits, but that will be after I do photoshoots with a couple of models that I know. I will do their makeup, style them, and take their photos :) This is really fun because I have done this before and it is just so much fun because I get to spend time with my friends while I do what I love. To not get off topic... My inspiration for this look was night time. This look looks a bit like the galaxy toward the outer corner of my eye and toward the inner corner of my eye it looks neutral. 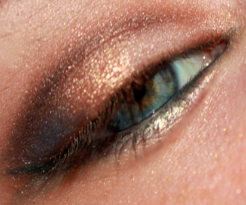 I pulled this eye makeup off with green eyeliner on the bottom winged lightly out. In this look I used my naked palette by Urban Decay and some random eyeshadows from Victoria's Secret.